Bringing up the subject of tougher speed limits in Germany is a lot like suggesting more stringent gun control in the United States. A polarizing issue par excellence, speedy German people react almost as emotionally to the first suggestion asÂ heavily-armed American people do to the second. Just ask that little old lady in the wheelchair. It doesnâ€™t really matter if it might make sense or not (I think it would), it is a subject that is emotional geladen (emotionally charged, as in loaded, as in gun) and therefore an easy one to have blow up in your face. That is why it is all the more surprising to me that the SPD would seriously suggest the introduction of a general speed limit on the autobahn (130 kilometers per hour orÂ 80 mph) as they did at their party congress held over the weekend. 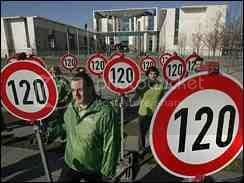 An environmentally-friendly measure meant to reduce emissions on German roads, many SPD heavyweights themselves (Minister for the Environment Sigmar Gabriel, for instance, a heavyweight in more ways than one) question the logic of speed limits. Chancellor Angela Merkel jumped for joy at the announcement and jumped on the issue immediately and repeatedly, saying on Sunday that her government would not try to introduce a speed limit on the autobahn never ever and that everybody can keep driving like bats out of hell until they are blue in the face, or pass out, or whatever comes first. Damn. Just when it looked as though the folks at theÂ SPD might have turned the corner sort of maybe perhaps andÂ begun slowing down their slide into opposition oblivion, they shoot themselves in the foot with a dumb albeit loaded issue again. But the SPD has a long tradition when it comes to stuff like this. Itâ€™s just what they do. No user commented in " The German Need For Speed "